I chose the name kenoticket because of my passion for the game. Luckily, I live close to Nevada, so I head over the state line as often as possible. 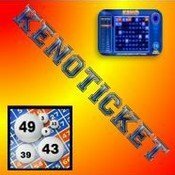 I have been selling online for over 16 years under the name kenoticket. On eBay, I had obtained the "Top Rated Seller" status and had been at that level for several years. I have well over 1100 feedbacks, all positive. My 5 star rating numbers are all 4.9s and 5s. I was also a seller on Bonanza for the over 5 years, again under the kenoticket name. I had well over 800 transactions, and again a 100% positive rating. And now, with my own website at kenoticket.net I am closing in on 1300 items listed with over 400 sales and no complaints. Feel free to contact me at any time if you have any questions or concerns about any of the items I have listed, or about any problems with a shipment you receive.